Want your name on the world’s fastest (electric) motorcycle? The Green Envy and the KillaJoule are being built to show that eco-friendly, low-emission technology is something to count on. And that electric vehicles can be insanely fast, and faster than internal combustion engines. They are also being built to inspire people to make things themselves, and to inspire kids to pursue a career in STEM. The main team behind these two uber-fast vehicles is me (Eva Hakansson) and my husband Bill Dubé. I have set 15 world speed records, and Bill has lost count how many records he set with his now retired electric dragbike. But racing is expensive, and being a university lecturer doesn’t pay very well. It is easy to see why that equation doesn’t work out. As a supporter of the Green Envy and the KillaJoule, you will be part of history! The planned debut for Green Envy is at the salt flats in Australia in March 2020 (preliminary specs here), but before then the plan is to race the KillaJoule in Australia in March 2019. The purpose if of course to attempt new records, but even more importantly is to try out new components (including brand new, super-innovative wheels) for the Green Envy. There are support levels that will fit every wallet and piggy bank, and every level comes with perks. And if you don’t want any perks, there is a solution for that as well. If you just want to silently make history and make the world a better place, just select your desired amount of “Additional Karma” in the webstore. All sponsorship levels are available in our webstore, but you can also send the appropriate amount to paypal [insert “at” here] evahakansson [dot] com and include a message with the support level and name(s) for the signed postcard and personalized perk(s) where applicable. If you prefer to send a check, send it to Eva Hakansson, P.O. Box 1243, Wheat Ridge, CO, 80033, USA, or to her work address: Eva Hakansson, Department of Mechanical Engineering, University of Auckland, 20 Symonds St., Auckland 1010, New Zealand. Postcard signed by rider/builder Eva Hakansson. Free shipping to anywhere in the world. Your name will be listed on the Partners & Supporters page. Click here to choose this level of support. The names on the KillaJoule are placed on the sidecar. The names on the Green Envy will be placed in a similar fashion. 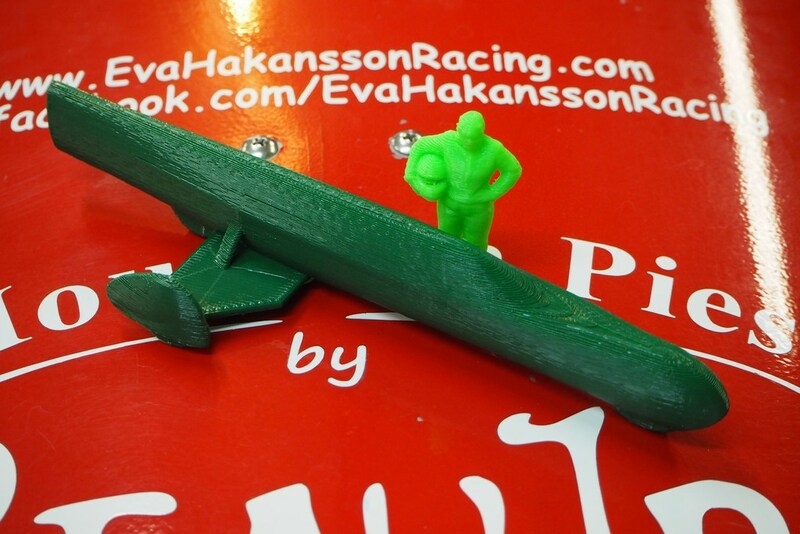 A 3D printed scale model of the Green Envy or the KillaJoule (your choice) and rider/builder Eva Hakansson. The scale model is 6 inches (~150 mm) long, and is designed and printed by Eva. Free shipping to anywhere in the world. 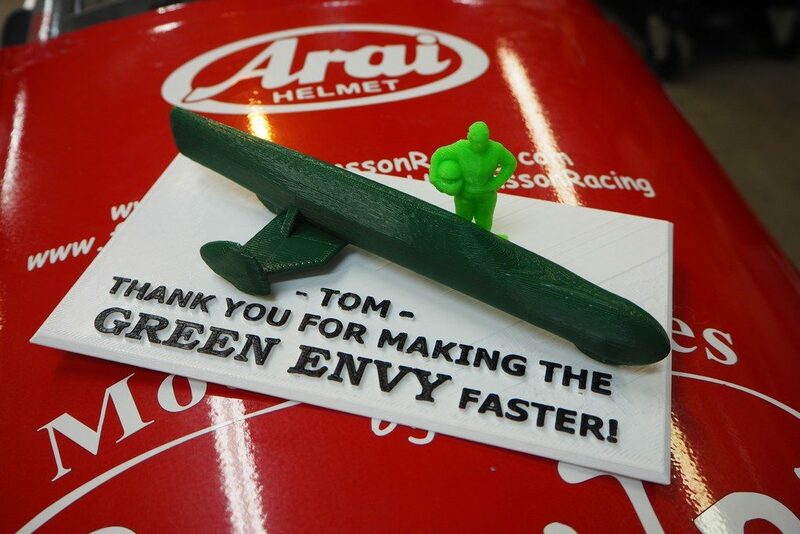 This level of support includes a 3D printed scale model of the Green Envy or the KillaJoule (your choice). The scale model is made from corn-based plastics and is compostable if you ever would get tired of it. Your 3D printed scale model of the Green Envy or KillaJoule will be mounted on a personalized platform. Free shipping to anywhere in the world. (Green Envy is shown, the exact color will depend on the availability of 3D printing filament). This level of support includes a 3D printed scale model of the Green Envy or the KillaJoule (your choice) mounted on a personalized platform. Specify what name you want on the platform. The scale model is made from corn-based plastics and is compostable. Two additional personalized 3D printed scale models (they will look great in the lobby of your business or in your bookcase). All three models may have different names. Free standard shipping to anywhere in the world. Logo space for your business or organization, minimum 2 in x 6 in (50 mm X 150 mm), on both sides of both the KillaJoule and the Green Envy. (You provide a logo and we make the vinyl artwork, or you can provide your own stickers). Coffee cup or personalized team shirt (dependent on availability, may be substituted for other KillaJoule or Green Envy item). Additional logo space, total of at least 4 in x 10 in (100 mm x 250 mm), on both sides of both the KillaJoule and Green Envy, alternatively one prominent location on the nose or sidecar. Two additional coffee cups and personalized team shirts (dependent on availability, may be substituted for other KillaJoule or Green Envy item)..
Use of the Green Envy or KillaJoule in marketing material (subject to prior written approval, Eva Hakansson reserves the right to deny use if the content doesn’t agree with the mission of this racing program). Logo space on team shirts. Additional logo space, total of at least 8 in x 14 in (200 mm x 300 mm), on both sides of the the KillaJoule and Green Envy, alternatively one prominent location on the nose or sidecar. Make a suggestion! What do you want? Come to the races as part of the crew, perhaps? Or do you want advertisement space or present endorsed products on ScienceEnvy.com? Email me at sponsorship [insert “at” here”] evahakansson [dot] com. 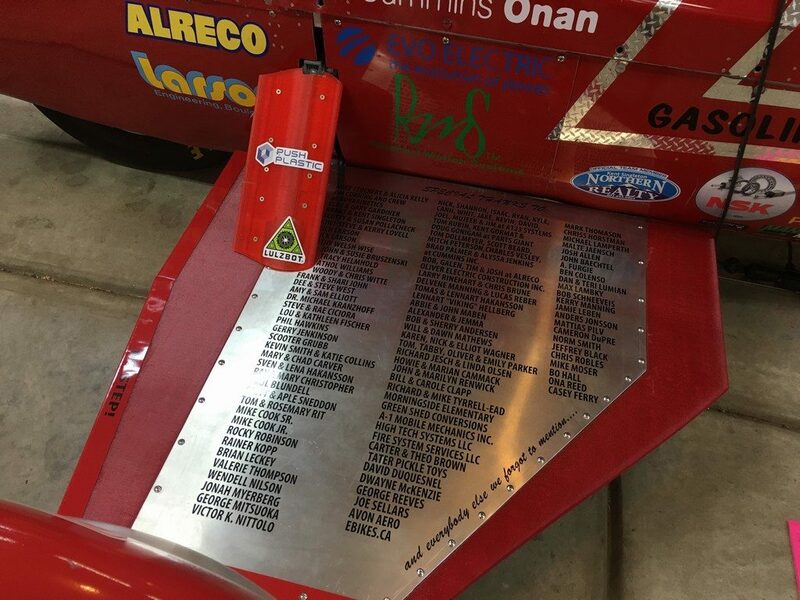 All sponsors and supporters will be prominently displayed on the KillaJoule and Green Envy, and included on the Partners & Supporters page. In-kind sponsorships with parts, labor, services, and similar counts of course in the same way as monetary support! There is plenty of space for _your_ logo on the KillaJoule and the Green Envy!